Plovdiv, Bulgaria - Current News - The oldest script writing in the world – created in Bulgaria? The oldest script writing in the world – created in Bulgaria? “Only the priest used to know what the ancient ‘book’ said…” is the opinion of Prof. Nikolay Ovcharov. According to him, the theory of the oldest script in world found in our lands is not just the sensation created by some pseudo-researchers. Prof. Ovcharov demonstrated a ceramic tile with a pictographic script on it, similar to the Egyptian script writing. 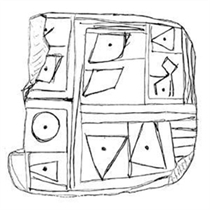 The tile was uncovered in South Bulgaria archaeological excavations. The tile has spent the last 20 years as part of private collection and is in quite good condition.